In the early 1940's, Syd Nathan was having success selling used records in his downtown Cincinnati dry goods store. His customers were working-class Southern blacks and whites who, drawn by good paying factory jobs of the World War Two economic boom, had recently moved north to the Cincinnati area. In 1943, Nathan decided to make his own records to fill the demand for down-home blues, rhythm & blues and country music. By 1945, Nathan had borrowed money from friends and family, rented an old building and launched his own label - King Records. He hired white artists and black artists and marketed his records directly to local working-class whites and blacks. Nathan had many of his songs recorded by both black and white artists and successfully cross-marketed in the rhythm & blues and country markets. This cross-pollination of musical styles would be a major infulence for later artists in the development of rockabilly and popular rock and roll. Nathan wanted King to be a self-contained record company that could record, master, press, print and ship records entirely in-house. 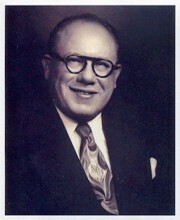 He created a subsidary company, Royal Plastics, to handle the pressing of records. In the early 1950's, a growing market for recording local artists was recognized. As the seven inch wide, 45 rpm format became popular many local artists and groups wanted to record their own record and try their luck in the booming music business. 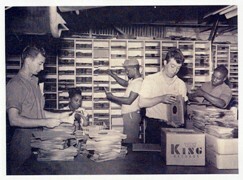 Sometime during 1954, King began to market their custom pressing services to local musicians. Over the next 15 years, King produced thousands of releases for small, independent labels and artists. Account Numbers: On early King pressings the account number is located in the matrix directly across the label from the matrix number. Later King pressings include the account number first as part of the matrix number. King assigned account numbers chronogically starting with number 300 sometime in 1954. Account numbers may be used to date the first release issued using that account number. Later releases under each account number may be estimated but can not be determined exactly without additional information such as Billboard reviews, etc. Account numbers earlier than 300 probably do not exist. NOTE: The data in this table is estimated (particularly the last six years) and subject to further modifications. Syd Nathan died of heart disease complicated by pneumonia on March 5, 1968 in Miami, Florida. In October, King was sold to Starday Records. The recording studio and custom pressing operation continued to operate at 1540 Brewster Avenue in Cincinnati through the end of 1971.